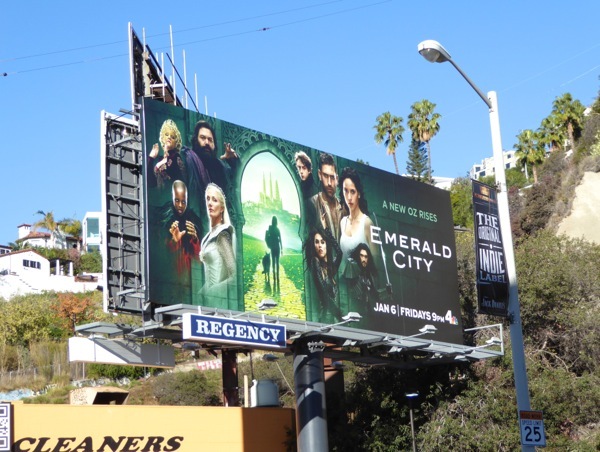 In 2017 what's old is new again as The Wizard of Oz is reimagined for a new generation on the small screen in NBC's Emerald City. Adria Arjona is the new 'Dorothy Gale' transported to a magical world where Vincent D'Onofrio's steampunk 'Wizard' battles the matriarchal magical rule of 'Glinda' (Joely Richardson), 'West' (Ana Ularu) and the 'Wicked Witch of the East' (Florence Kasumba). Helping her as ever are reinterpreted versions of the 'Scarecrow' aka 'Lucas (Oliver Jackson-Cohen), 'Tin Man' and 'Cowardly Lion', plus her trusty canine sidekick 'Toto'. From the looks of things the series directed by Tarsem Singh may be radically different from the original inspiration of L. Frank Baum's Land of Oz books and we're certainly not in Kansas anymore. 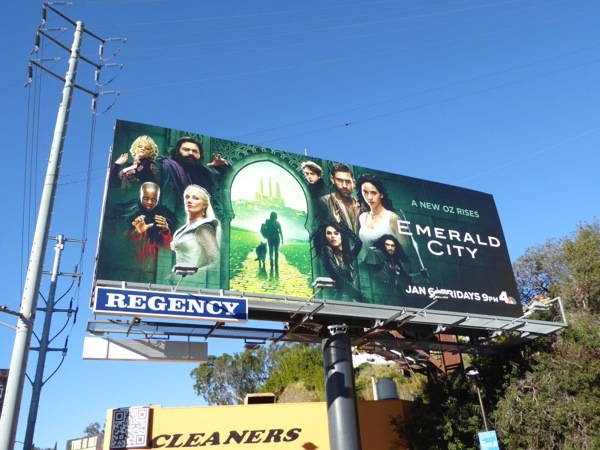 This vibrant series launch billboard was first snapped along West Hollywood's Sunset Strip on December 17, 2016. 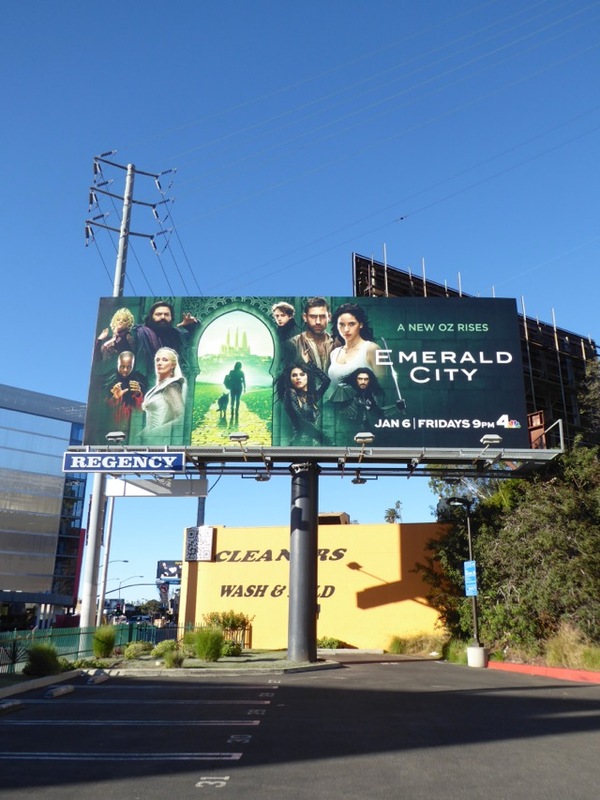 Fans of the Wizard of Oz can also enjoy Disney's Oz The Great and Powerful movie billboards from 2013 and these billboards for The Wiz Live! filling the skies in the past twelve months. 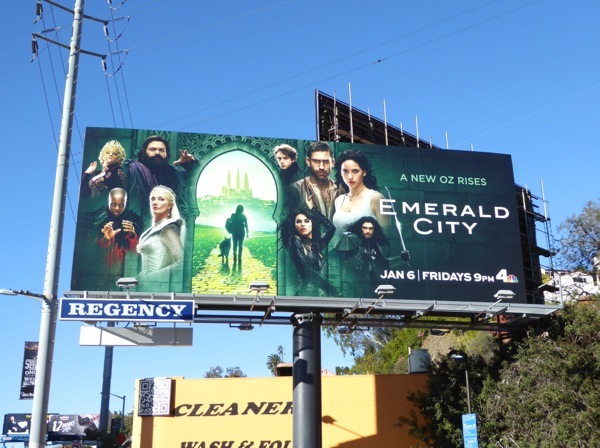 It's time to follow the Yellow Brick Road once again and see where the fantastical journey takes us, but before you do that, stick around the rest of the week for more great TV show billboards from the new Winter season.